The first day of school brings a wide range of emotions for the entire family. These books should help bring a little laughter and emotional support for first-day nerves. Mae’s First Day of School by Kate Berube. Every child (and parent) feels nervous on the first day of school. Fear of the unknown is difficult for us all. This book shows a relatable progression of a girl’s first day of school and how she transforms from nervous to excited and hopeful. The World-Famous Book of Counting by Sarah Goodreau and The Greatest Opposites Book on Earth by Lee Singh and Tom Frost. These books are full of creative ways to engage a young reader from pop-ups to flaps. Kids love them and adults love the artistic designs and illustrations. This book is perfect for Pre-K children but also fun for Kindergarten and beginning readers who can retell the story themselves and feel they are reading to build a little confidence. Adventures to School: Real-life Journeys of Students From Around the World by Baptiste Paul and Miranda Paul, Illustrated by Isabel Munoz. This nonfiction book is a refreshing way to introduce children to school. It shows thirteen different children's journeys to school from around the world. Children will also enjoy learning a little about each country, as the book highlights the country’s flag and some key details. The Friend Ship by Kat Yeh, Illustrated by Chuck Groenink. One of my favorite books of the year! Sometimes you are searching for true friendship or something new in life, while everything you need is right in front of you. 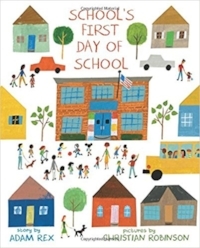 School's First Day of School by Adam Rex, Illustrated by Christian Robinson. Everyone gets nervous on the first day of school, even the school building itself. Nothing goes as planned for the building on its first day with children, but all is okay in the end and everyone wants to try it again the next day. A unique take on first-day jitters. The Teacher’s Pet by Anica Mrose Rissi, Illustrated by Zachariah OHara. A class bands together to help their teacher when his love for the class pet clouds his judgment. The tadpole grows into a hippo. The pet's size and needs are destroying the classroom. Kids love the idea of being in on a secret and knowing more than a teacher. The Smallest Girl In The Smallest Grade by Justin Roberts, Illustrated by Christian Robinson. This book reminds us that you can make a big impact on those around you by speaking up. Sally McCabe might be small, but she’s an observer of the world, and so one day she realizes she can make a difference despite her age or size. The I'm Not Scared Book by Todd Parr. I should probably just carry all of the Todd Parr books in my back pocket for every messy life situation. The author writes about the most complex topics and feelings and makes them simple for children. This book is a beautiful reminder that when we feel scared, we often can take a simple step to feel calmer or to laugh. The Most Magnificent Thing by Ashley Spires. This book will resonate with perfectionists and worriers. It helps our children see the beauty in the process rather than the product. You might also want to check out The Girl Who Never Made Mistakes. A Squiggly Story by Andrew Larsen, Illustrated by Mark Lowery. This book is a cute story about the power of writing and getting started. You don’t have to know how to write everything or anything to create something beautiful. For 5 Ways to Cultivate Confidence in Little Learners click here!